Syracuse coach Jim Boeheim coaches from the sidelines. Mandatory Photo Credit: Kicia Sears, The Juice Online. 2019 center Jesse Edwards committed to Syracuse on Friday afternoon according to multiple reports. He is the fifth player in the Orange’s 2019 class. Edwards, a 6-foot-11, 205-pound prospect is currently playing at IMG Academy in Florida. He’s only been in the United States since January, having grown up in the Netherlands. Edwards had an offer from Georgia Tech and was also receiving interest from Providence, Stanford and Creighton. He visited Syracuse on April 1. He joins a recruiting class that includes guards Joe Girard III and Brycen Goodine, wing Quincy Guerrier, and center John Bol Ajak. 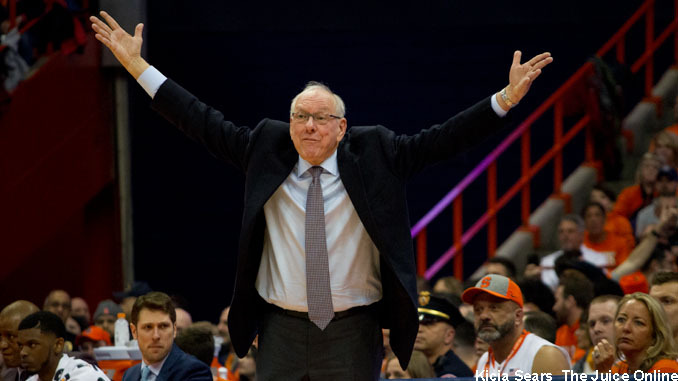 Edwards provides depth for the Orange, who lose graduating center Paschal Chukwu. Bourama Sidibe and Marek Dolezaj also played at center for SU last year. With the commitment, Syracuse has used its maximum allotment of 13 scholarships, assuming forward Oshae Brissett returns to SU after declaring for the NBA Draft (he has not signed with an agent and is currently eligible to return).